The cast of 'Oklahoma' on Broadway. Photo by Little Fang Photo. Circle in the Square, New York, NY. We currently have Chicago; Kiss Me, Kate; My Fair Lady; and Oklahoma! on Broadway’s revival train. 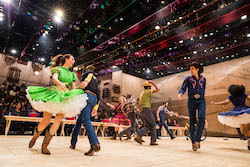 The newest production, Oklahoma!, is exciting for many reasons: an in-the-round stage setting, lights-on atmosphere, diverse casting, cinematic special effects, electronic and distorted sound, a special treat (literally) at intermission, and a mission to reduce gun violence (by making a donation to the Gun Neutral Initiative for every gun that is seen on stage). Even with keeping the script and score relatively intact, this revival diverted far from previous productions we’ve seen on Broadway. Curly and Judd are not polar opposites; they’re less black-and-white and instead grey in terms of their roles as protagonist and antagonist. Curly is a bit of a bully (both to Judd and also to Laurey in some ways), where Judd is an unsettling mix of innocent young boy and disturbed recluse (a character that brings to mind many of the school shooters we’ve sadly seen in recent years). A lot of the scenes with physical action that condemns Judd (in the original production) is done in pitch black in this version (such as Curly confronting Judd in the smokehouse, Judd becoming intimate with Laurey). Everything is much more ambiguous (including a hint of a romantic relationship between the two male leads themselves). And even though I knew what was coming at the end of the show, I felt stunned by this revival’s unique approach. I found myself wanting to simply love Curly and hate Judd, but this revival added thick and muddy complexity, tension and mortality that make the characters — all of them — less archetypal and more human. I appreciate that I was forced to think rather than blindly take sides since we actually live in this grey area and not a black-and-white world of right and wrong. 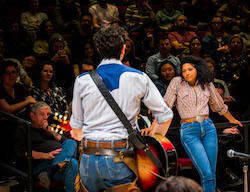 If it hasn’t already become clear, this new production of Oklahoma! takes a lot of risks. One other significant choice is that of the choreography. The only dancing (besides Will’s goofy two-step) occurs in the dream sequence and during “The Farmer and the Cowman” hoedown. Both scenes veer drastically from Agnes de Mille’s innovative storytelling ballet of yore. 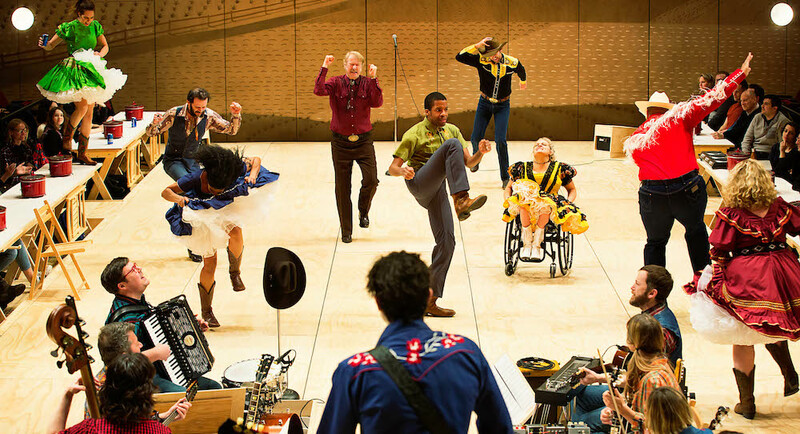 The cast of ‘Oklahoma’ on Broadway. Photo by Little Fang Photo. The dream ballet (which, of course, is more of a nightmare for Laurey) involves a new performer on stage to represent Laurey, the actor. 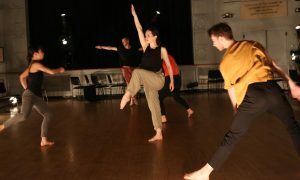 Plopping in a new dance character seems to go against the production’s sensibility. And what’s more, dream Laurey doesn’t resemble real Laurey at all. While the actor Laurey is mature, resigned and inquisitive, dream Laurey feels young, joyous and naïve. Both embody a strong-minded but internally-conflicted woman, but they are not the same Laurey. In a bedazzled “Dream Baby Dream” shirt, dream Laurey wanders around the center stage, making eye contact and smiling at individuals in the audience. 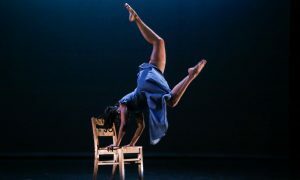 As the music gradually distorts, she gallops and sprints about the space — Searching for a true love? Escaping from a life of complacency? Running from her fears? We don’t really know. The other characters enter the stage, walking forward robotically and not paying any attention to dream Laurey. Maybe 20 loud cowboy boots drop from the ceiling, and Judd scrambles to brush them off stage. Dream Laurey runs (a lot), splats herself against the wall in an impressive tilt, and dives and rolls across the floor. By the end, we’re as exhausted and confused as Laurey waking up from her dream. There’s not much to say about the hoedown. It is pedestrian to the point of tedium. And while big song-and-dance production numbers don’t have to be part of a musical, Oklahoma! 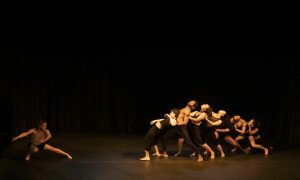 is famous for just that — the magic of choreographic storytelling and spectacle — and altering the dancing narrative was, for me, a big disappointment (I immediately went home and watched clips from de Mille and Susan Stroman’s productions on YouTube). This revival of Oklahoma! takes a lot of exciting risks — artistically, politically and aesthetically. Especially since the script and score remained pretty true to the original, I only wish the dancing had a bigger role in this exploration.